Another DIY project on my SSS. It was a whole day event which took me about 5hrs to complete. Use the medium size brush to coat the base and paint the main layer and use the small tip brush to touch up the corners and unpainted area. Leave every layer to dry for at least 10 mins before applying the next layer. 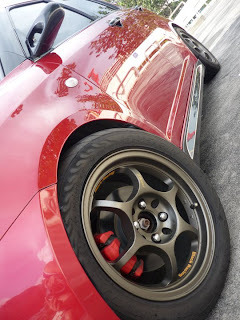 Install rims and hand tighten lug nuts before lowering the car. Remember to tighten the lug nuts with strength and in a Star shape direction. Good one. I am trying to color the brake caliper, as it will give the car a bespoke & upgraded look. I came across about some reviews on best brake caliper paint. I will buy this. But need suggestion to do this. I will remember your tips. I will clean the caliper properly before painting. I am a SpeedHunter too!